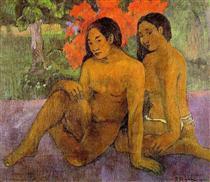 Paul Gaugin was a French Post-Impressionist painter, sculptor, printmaker, ceramist, and write, and was an important figure in the Symbolist movement, and his experimentation was indicative of the Synthetist style of modern art. 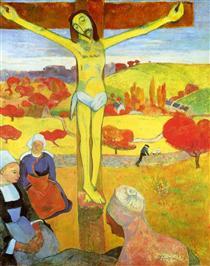 He also paved the way to the appreciation of primitivism, as his paintings employed many of the simplistic techniques employed by Naïve artists. He lived with his family as a child, and moved to Orleans’ France at the age of seven. As an adult, he joined the French Navy and later was employed as a stockbroker. 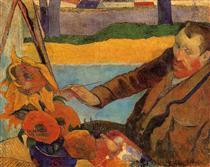 In France, he began painting in his free time, and became friends Camille Pisarro, who introduced him to other artists. As an individual he was prone to bouts of depression and once attempted suicide. As a painter, he was disappointed with Impressionism, as he felt that the tradition of European painting had simply become imitative, and lacked the symbolic depth that he desired. 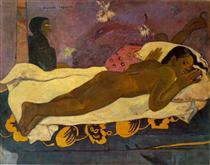 He also thoroughly enjoyed the art of Africa and Asia, which was full of symbolic depth, vigor, and meaning. 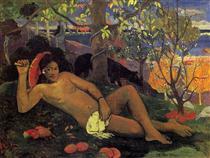 In his escape from the traditional European paintings, he sought to find a tropical paradise, in which he could paint in an increasingly primitive style and live off the land. He left his wife and five children to live with her family, and spent a short time as a laborer on the Panama Canal. Lacking recognition for his work and with no money, he sailed to the tropical islands of Tahiti and Marquesas, in French Polynesia. 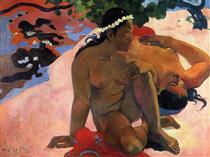 His exploits there generated much interest, especially his reputed sexual exploits with young native girls, some of which appear as the subjects in his paintings. In Polynesia, he often sided with the natives in their conflicts with the church and colonial authorities, eventually writing a book about his experiences there. Gaugin’s physical escape allowed his stylistic escape of post-Renaissance painting, as he paid little attention to classical perspective and eliminated gradations of color and shading. Inspired by the primitivism of the countries in which he lived, he also used primitive elements in his paintings to great success. 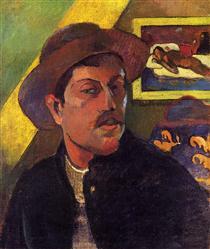 Eugène Henri Paul Gauguin (/ɡoʊˈɡæn/; French: [øʒɛn ɑ̃ʁi pɔl ɡoɡɛ̃]; 7 June 1848 – 8 May 1903) was a French post-Impressionist artist. 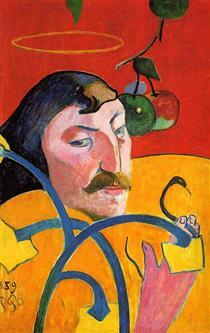 Unappreciated until after his death, Gauguin is now recognized for his experimental use of color and Synthetist style that were distinctly different from Impressionism. 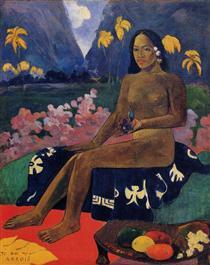 Towards the end of his life he spent ten years in French Polynesia, and most of his paintings from this time depict people or landscapes from that region. 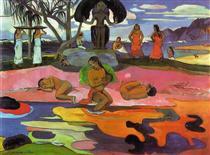 Gauguin was born in Paris to Clovis Gauguin and Alina Maria Chazal on June 7, 1848. His birth coincided with revolutionary upheavals throughout Europe that year. His father, a 34-year-old liberal journalist, came from a family of petit-bourgeoisie entrepreneurs residing in Orléans. He was compelled to flee France when the newspaper for which he wrote was suppressed by French authorities. Gauguin's mother was the 22-year-old daughter of Andre Chazal, an engraver, and Flora Tristan, an author and activist in early socialist movements. Their union ended when Andre assaulted his wife Flora and was sentenced to prison for attempted murder. 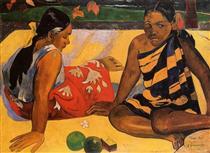 Paul Gauguin's maternal grandmother, Flora Tristan, was the illegitimate daughter of Thérèse Laisnay and Don Mariano de Tristan Moscoso. Details of Thérèse's family background are not known; her father, Don Mariano, was a Spanish nobleman and an officer of the Dragoons. Members of the wealthy Tristan Moscoso family held powerful positions in Peru. Nonetheless, Don Mariano's unexpected death plunged his mistress and daughter Flora into poverty. When Flora's marriage with Andre failed, she petitioned for and obtained a small monetary settlement from her father's Peruvian relatives. She sailed to Peru in hopes of enlarging her share of the Tristan Moscoso family fortune. This never materialized; but she successfully published a popular travelogue of her experiences in Peru which launched her literary career in 1838. 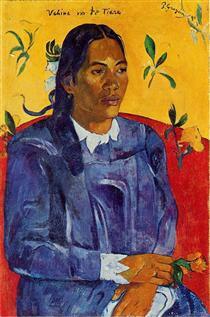 An active supporter of early socialist societies, Gauguin's maternal grandmother helped to lay the foundations for the 1848 revolutionary movements. Placed under surveillance by French police and suffering from overwork, she died in 1844. Her grandson Paul "idolized his grandmother, and kept copies of her books with him to the end of his life." 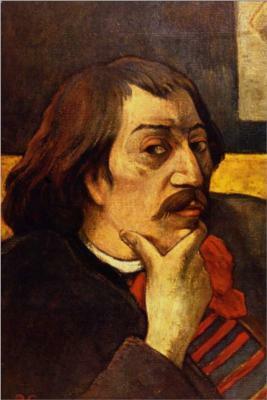 In 1850, Clovis Gauguin departed for Peru with his wife Alina and young children in hopes of continuing his journalistic career under the auspices of his wife's South American relations. He died of a heart attack en route, and Alina arrived in Peru a widow with the 18-month-old Paul and his 2 ½ year-old sister, Marie. 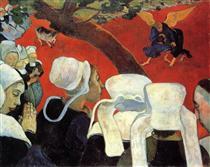 Gauguin's mother was welcomed by her paternal granduncle, whose son-in-law would shortly assume the presidency of Peru. To the age of six, Paul enjoyed a privileged upbringing, attended by nursemaids and servants. He retained a vivid memory of that period of his childhood which instilled "indelible impressions of Peru that haunted him the rest of his life."